One of the key elements in a diffractive UV-VIS spectrometer is the line array detector used to measure intensity versus wavelength. The SONY ILX511B front illuminated CCD is a popular choice due to its high sensitivity and low cost. In 2014 Hamamatsu has launched the S11639 CMOS detector as an alternative to the SONY ILX511B at roughly the same price level. The purpose of this technical note is to compare the basic performance of the S11639 CMOS with the ILX511B CCD. Booth detectors are non-cooled with 2048 pixels of pixel size 14 μm x 200 μm. It is generally a difficult task to make a direct comparison of detector arrays based purely on the data sheet information. Therefore, Ibsen Photonics has done comparative measurements on these two detector arrays when used inside an actual spectrometer unit, and in this Technical Note we show results for sensitivity and Signal-to-Noise Ratio (SNR) for the two detectors. 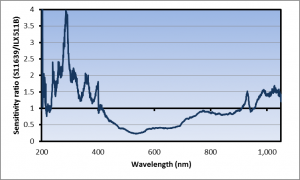 We used the Ibsen Photonics FREEDOM UV-NIR FSA-300 spectrometer covering 190 – 1100nm for the test. It is important to note that Ibsen Photonics has no preference for any of the two detectors and we sell spectrometers using both. The purpose of this technical note is merely to provide some objective information that we think is useful for our customers in deciding which detector type to choose. Also, while we focus on sensitivity and SNR in this technical note, it is important to note that there are other parameters (like linearity, built-in dark pixels, etc.) that may also influence the choice of detector for a given application. The sensitivity of a spectrometer is determined by many parameters (diffraction efficiency of the grating, reflectivity of mirror coatings, size of slits and apertures, detector sensitivity etc.). In order to compare the sensitivity of the two detectors alone we measured the spectral response of the same spectrometer equipped with either the SONY ILX511B or the Hamamatsu S11639 detector. The ILX511B was coated with a Lumigen coating to provide UV sensitivity while the S11639 detector was used as is from the supplier since this detector already had UV-sensitivity. For measurements in the UV a Deuterium lamp was used and the integration time was set to 1000 msec for both detectors. For the VIS region a Halogen lamp was used as light source and the integration time was 100 msec. The gain in the electronics was adjusted to ensure that the dynamic range of the detector matched the dynamic range of the 16 bit A/D converter. The results are shown on Figure 1 and clearly show that the two detectors provide sensitivity of the same overall magnitude. However, there are important differences. 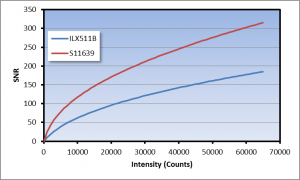 In the UV range the S11639 provide up to four time the sensitivity of the ILX511B while in the VIS range the ILX511B provides up to 4 times the sensitivity of the S11639. In the NIR range the sensitivity of the two detectors are roughly the same. However, sensitivity is only telling us how much signal level we can get. We also need to consider the noise level of the two detectors. 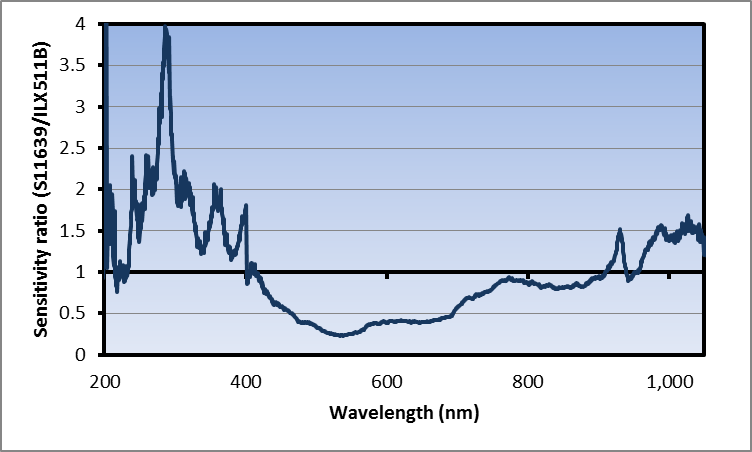 Figure 1: Measured sensitivity ratio of a UV-VIS spectrometer using either the ILX511B or the S11639 detector. The RMS noise level of a detector depends on the optical signal level on the detector and the integration time so, generally speaking, there is not a single number characterizing SNR for a spectrometer. If the integration time is kept below ~500 msec the RMS noise is basically independent of the integration time. The measured RMS noise as a function of signal level is shown on Figure 2 for an integration time of both detectors of ~50 msec. 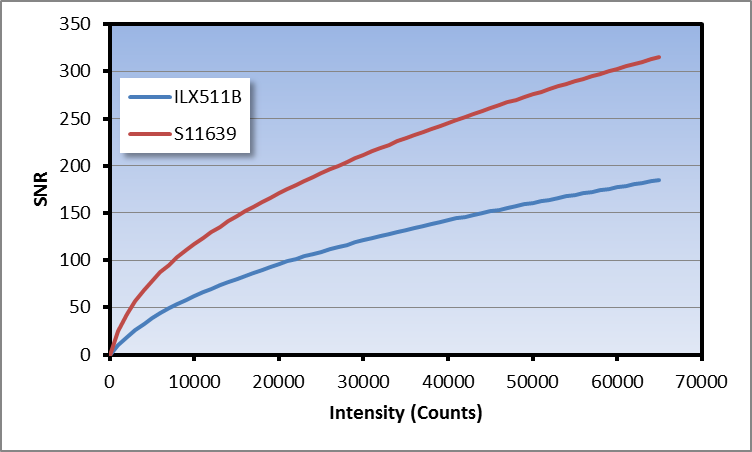 As can be seen the RMS noise is roughly 2x lower for the S11639 than for the ILX511B. Table 1 lists these parameters for the two detectors and Figure 3 shows the SNR as a function of signal level. Figure 2: Noise as a function of signal level (16 bit A/D converter). Figure 3: SNR as a function of signal level (16 bit A/D converter). Since both the sensitivity and the SNR of the S11639 is better than the ILX511B in the UV the S11639 seems like the obvious choice in the this wavelength region. However, in the VIS it is a little bit more complicated to make the comparison. Using Figure 1 and Figure 3 it is possible to estimate the SNR difference at any signal level, wavelength and integration time (as long as the integration time is kept below ~500 msec). As an example, let us assume we adjusted the integration time of a spectrometer with the ILX511B to 50,000 counts at 600 nm. This will provide a SNR of 160 read from Figure 3. If we use the same spectrometer with the S11639 and keep the same integration time, we will get a signal level of 20,000 counts because of the lower sensitivity of the S11639 and therefore the SNR obtained at 600 nm will now be 170. One way to improve the SNR is to perform averaging over a number of consecutive measurements. By doing so, the noise level is improved by a factor of the Square Root of N, where N is the number of measurements. 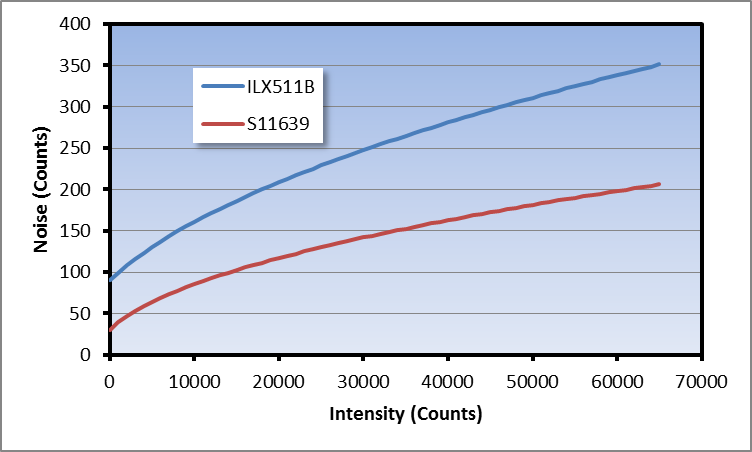 So, since the ILX511B can reach the same signal level as the S11639 in one third of the integration time in the VIS range, we can use this to perform three times as many measurements with the ILX511B compared to the S11639. As an example, let us assume we adjust the integration time of a spectrometer using the S11639 to 50,000 counts at 600 nm. Without averaging, this provides a SNR of 275. 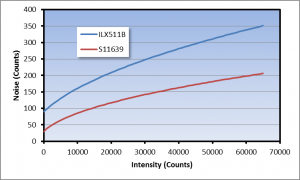 For a spectrometer with the ILX511B we can obtain the 50,000 counts in one third of the integration time. So, we will do two measurements and calculate the average of the three measurements. This will give us a SNR using the ILX511B of sqrt(3)*160 = 277. This example is just another way of confirming that the two detectors can provide the same SNR in the VIS range. If you are only interested in the UV or NIR range, you should opt for the Hamamatsu S11639 since it provides better SNR and the same or better sensitivity. If you are only interested in the VIS range and need the best possible sensitivity/shortest possible integration time you should opt for the SONY ILX511B. If you are only interested in the VIS range and mostly focused on the SNR the S11639 and ILX511B can provide basically the same performance.